Two compounds with the same brute formula are called isomers. There are different types of isomers: homomers, stereoisomers, constitutional isomers. In particular a stereocenter or stereogenic center is any point in a molecule bearing groups, such that an interchanging of any two groups leads to a stereoisomer. The presence of the stereocenter determine the possibility of stereoisomers that are the non-overlapping mirror shape of the other. A chiral center is an atom having a set of ligands in a spatial arrangement that is not superimposable to its mirror image. Enantiomers are not superimposable and are the mirror images of each other. Enantiomers originating from the impeded rotation around a simple bond are known as "atropisomers". Two enantiomeric molecules have the same physical properties, except one: the ability to rotate the plane of polarized light. Two compounds with the same brute formula are called isomers. The isomerism (from the Greek ἰσομερής, isomerès, composed of ἴσος, isos, "equal" and μέρος, méros, "part") is the phenomenon for which different substances for physical properties and often also for chemical behavior have the same brute formula, that is, the same molecular mass and the same percentage composition of atoms. Homomers are molecules which have identical brute formula, same connectivity and are superimposable. 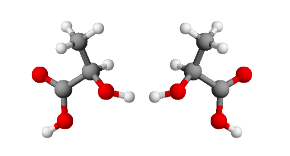 Constitutional (or structural) isomers are molecules which have identical brute formula but different connectivity. They are compounds having the same molecular formula but different structural formula. This implies different physical and chemical properties, due to the different bonds of the elements that make up the molecule. chain isomers - isomers that differs in the structure of the carbon "skeleton", i.e. in the presence and in the position of ramifications or rings. This type of isomers have different physical properties, but often quite similar chemical reactivity. positional isomers -isomers that differs in the position of the functional group. Isomers of this type have different physical properties, but often similar chemical reactivity. functional group isomers - isomers that have the same molecular formula (that is, the same number of atoms of the same elements), but the atoms are connected in different ways so that the groupings are dissimilar. They have very different chemical and physical properties. Stereoisomers are molecules with identical brute formula, same connectivity, but the different spatial orientation of atoms makes them non-superimposable. geometric isomers - molecules in which a C=C is bound to two different groups (or cis or trans). conformational - the possible orientations given by the rotation of a C-C bond and the possible conformations of a molecule produce molecules with the same brute formula, equal connectivity but not overlapping. A conformational isomer is also called conformer or rotamer. The energy barrier between the various orientations is very small and, at room temperature, one changes into the other. Although each has different stability. configurational, or optical isomers - are molecules containing stereogenic elements. A stereogenic center is an element (an atom as instance) that causes geometric properties of the molecule. In particular, a stereocenter or stereogenic center is any point in a molecule bearing groups, such that an interchanging of any two groups leads to a stereoisomer. The presence of the stereocenter determine the possibility of having stereoisomers that are the non-overlapping mirror image of the other. Enantiomers are not superimposable isomers and are the mirror images of each other. Molecules showing this isomerism are called chiral. Chirality is the property of molecules that can not be superimposed on the mirror image. Two enantiomeric molecules have the same physical properties, except one: the ability to rotate the plane of polarized light. This capacity, called rotatory power, is equal in absolute value, but opposite of sign for each of the two enantiomers. Two enantiomeric molecules also exhibit the same chemical reactivity in achiral or chiral racemic environment; on the contrary, their reactivity towards an enantiomer of another couple can be quite different. A point can be a stereogenic center, such an atom, typically a carbon carrying four different substituents. This is called called chiral center. A chiral center is an atom having a set of ligands in a spatial arrangement that is not superimposable to its mirror image. Example: The most common stereogenic center is the carbon atom with sp3 configuration, with tetrahedral geometry, and four different substituents linked to it. The stereocenter does not necessarily have to be a carbon atom; any atom having tetrahedral geometry and four different substituents introduces an asymmetry into the molecule. In most cases, the interconversion of stereoisomers (pyramidal inversion) is very rapid and it is not possible to isolate them. In some cases, especially for appropriately substituted phosphines, the conformational interconversion barrier is high enough to make the isolation of optically pure isomers possible. An axis can be a stereogenic center. By rotating a half of the molecule around the stereogenic axis by 180º, a stable stereoisomer of the molecule is obtained. These stereoisomers are not always enantiomers. For the stereogenic axes whose rotation leads to the enantiomer, the expression "chiral axis" is also used. Example: the link between the two rings of a 2,2 ', 6,6'-tetrasubstituted biphenyl is also stereogenic axis, where the substituents are large enough to prevent the free rotation of the rings around this bond. The steric hindrance produced by the substituents forces the rings not to lie on the same plane. Moreover, if each ring has two different substituents, then the molecule will be chiral. Enantiomers originating from the impeded rotation around a simple bond are known as "atropisomers". A plane can be a stereogenic center (more rare than the others). This category includes enantiomers, isomers of which one is the non-overlapping mirror image of the other. Typically two configurational isomers in which one is not the mirror image of the other are called diastereoisomers, although all pairs of non-enantiomeric stereoisomers can be considered types of diastereoisomers.